A farm 37 Kilometres outside the Freestate hamlet of Memel has the rather dubious distinction of having been the site of South Africa’s first commercial airline crash that occurred on the 15th May 1948. The incident, recounted by the Sunday Time’s Tim Couzens (16th May 2000), was witnessed by a Mrs Botha of the farm Rosedale who had been in her kitchen when she heard an unusual droning noise approaching. As she reached the kitchen’s doorway to investigate, she caught a fleeting glimpse of a plane as it emerged momentarily from the early morning mist. The plane’s altitude was apparently so low that it’s wings were clipping the nearby pine trees. As it disappeared Mrs Botha heard a crashing sound, akin to a wooden chair being smashed on a cement floor. 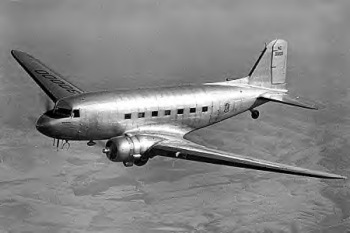 The Skyliner – a derivative of the Douglas DC-3, an American fixed wing, propeller driven aircraft whose speed and range revolutionised air transport in the 1930’s and 1940’s – belonged to Mercury Airways and had left Stanford Hill Airport in Durban at 06H23 that morning headed for Palmietfontein Airport in Germiston (now Oliver Tambo International Airport), where it was due to have arrived at 07H53. Piloted by Commander J N Smith, who had repeatedly asked Palmietfontein for homing bearings, the plane had been flying practically blind since take off due to the bad weather conditions experienced en route. Records revealed that the last bearing had been transmitted by Palmietfontein at 07H33 but was not confirmed or acknowledged by Commander Smith, as was required. At 07H20, as the plane overflew Rosedale, light rain and thick mist obscured visibility causing the aircraft to slam into the dark craggy outcrop of Spitzkop just below the summit after which it exploded. Mrs Botha’s son who managed the farm was horrified and promptly phoned the Vrede Police Office then proceeded to climb the mountain in search of survivors. Although not overly alarmed initially, Palmietfontein expressed concern after an hour however and notified the Civil Aviation Council. The South Africa Air force’s Nr 2 Air Wing stationed at Zwartkop’s Air Base was placed on high alert as it dawned on them that they were possibly facing the single biggest air accident in South Africa up to that point. When Mr Botha reached the summit, the scene was truly horrific. Bodies still on fire strewn up to 100 metres from the fuselage, burnt and ripped seats, mangled propellers, personal belongings including children’s shoes (which Commander Smith was transporting for a friend) scattered throughout the site and money blowing about in the autumn wind. Save for a section of fuselage bearing the registration ZS-BWY and the tail, the plane had completely disintegrated. The adverse weather conditions slowed the rescue effort, the waterlogged roads were almost impassable and there was only one way up the steep cliff, a stiff climb. Victim’s watches and the plane’s smashed instrument panel stopped between 07H25 and 07H38. A total of 13 bodies were found. They were lowered carefully down steep cliff faces and wrapped in hessian mielie bags before being placed in coffins which were brought in from Warden, Harrismith, and Standerton as there were not enough coffins in Vrede. These were then trucked up to Johannesburg. A few weeks earlier the Skyliner had hosted the finalists of the Wool Boards’ beauty contest who had been treated to lunch on board after which it had been flown to Durban where the Mayoress named it The City of Durban. It had been the first passenger aircraft to carry sleeper accommodation, comprising two private cabins in the front section of the passenger cabin. With a maximum cruising speed of 240mph (380kms/hour), the aircraft had more powerful engines than standard DC-3’s. At the time, Commander J N Smith, an accomplished pilot especially in bad-weather flying, had won the distinguished Flying Cross during the war and held the London – Johannesburg flying speed record of 28 hours. The fact that Commander J N Smith had recently completed a London to Athens flight entirely in cloud at 1 000 feet raised questions as to what had gone wrong. One theory suggested that the storm had caused the altimeter to “over read” (an apparently frequent occurrence during storms) resulting in a reading of 8000 feet as opposed to the actual reading of 7000 feet. Mercury Airways’ policy was to fly at a minimum of 1 500 feet above terrain and Commander Smith would have been acutely aware of the effect storms had on altimeters. Another theory was that the crew may not have been aware of north-easterly headwind that had developed which would have slowed the aircraft prompting the pilot to descend to a lower altitude in the belief that he was safely over the Witkoppe (White summits) when he was in fact still among them. Had this been the case we would have been justified in his actions as there was no major obstacle beyond this mountain rage en route to his destination. Between the pine trees at Rosedale and the crest of Spitzkop, a relatively short distance, the aircraft’s nose was lifted by almost 500 feet which proved to have been just a few meters shy of the altitude required to safely overfly the peak. Similarly, steering the plane just a few hundred metres to the left or right would have sufficed to clear the peak. Brigadier w H Gough, a distinguished 5O year old British army officer who had been awarded a Military Cross in World War One, been in charge of the evacuation of troops from Ceylon (Sri Lanka) was a pioneer in the training of paratroops and in 1941 arranged for instructors to be brought to India to train the British army. He had decided to settle in South Africa, and was on his way to London to fetch his wife and daughter. C.G Gross, a Hollander was on his way to visit mother who was ill at the time. A J Milne, a Krugersdorp based drainage engineer returning home. Other passengers were all somehow linked to Mercury Airways and appeared to have been on a free excursion of some kind. Thelma de Witt was Mercury Airways’ chief hostess. Pauline Rauch the hostess on this particular flight. Miss B Jarvis, a booking agent, was undertaking her first flight in order to gain experience in dealing with air passengers. Sidney Cross, was the wireless operator and had dune duty as a warrant officer in the RAF coastal command, followed by service in a transport squadron carrying out Foreign Office carrier duties in the Balkans. Mr H Mac Lennan of Rosettenville was the fright engineer and is wife, Patricia Mac Lennan who accompanied him on this flight, died with him. They were survived by one child. Although employed as a first officer Mercury Airways Hamilton Puntis, a quantity surveyor graduate of the University of the Witwatersrand had served in the South African Air Force bomber squadrons over the western Desert and ltaly. On this fateful day however he was flying as a passenger. The flight’s second pilot David Leppan was the son of Professor and Mrs H D Leppan, who just a month prior to the crash had lost their daughter in a car accident in Johannesburg. Commander Smith’s wife, who was unfortunately also on board the fateful flight died alongside her husband. The couple left behind five children, under the age of 13. As news of the deadly crash spread, nosey motorists visited the scene, placing additional pressure on the already bad roads and hampering recovery efforts. Police guards were deployed at the entrance to a narrow rock funnel – the only safe route to the site – in order to stop the hundreds of people who had turned up to witness the crash for themselves. Seventeen year old Marietjie Le Roux was one of these observers who had been helped up by Botha. They were married soon thereafter and lived on the adjacent farm with Rosedale being farmed by Botha’s brother. All that remains today is a lump of twisted aluminium as a keepsake. Marietjie Botha recounted that her husband could not bear to eat meat for a long time as he was haunted by the scene and the smell of burning flesh. Although nothing remains of the wreckage today, many people had signed their names on the tail which had survived intact and which for many years had adorned a cafe in Nelspruit or Dullstroom. Rumours also exist of a farm having being bought by police men, paid for from money collected at the scene that day. A heartbreaking discovery was a ticket belonging to one of the female passengers for a black dress due to have been collected from a department store in Johannesburg that day. The incident was considered by some as an omen. Only the pilot would have seen death approaching and then only for a split second. One or two passengers were found with their hands still in their pockets. A few feet higher or a few hundred feet to the left or right and they would have arrived at their destination safely. Spitzkop can be reached via the R 34 between Vrede and Memel. At 22km from the last turnoff to Vrede, or 30kms from Memel if you are coming the other way, turn at a road sign marked “Tafelkop” leading south. After 6km of dirt road, turn right at the farm Draaihoogte. After another 11km you will find Rosedale, signposted JP (Koos) Botha. Directly opposite is Spitzkop – you are facing the crash site. Unfortunately there is nothing to mark the spot.